"Administration Building, Vanity Fair, Providence, R.I." by J.L. & C.H. Seddon, Providence, R.I.
Administration Building, Vanity Fair, Providence, R.I.
J.L. & C.H. Seddon, Providence, R.I.
Used; Postmark: July 10, 1909. J.L. & C.H. 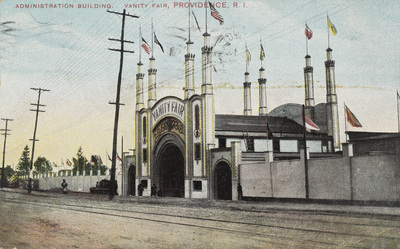 Seddon, Providence, R.I., "Administration Building, Vanity Fair, Providence, R.I." (1909). Rhode Island Postcards. 322.